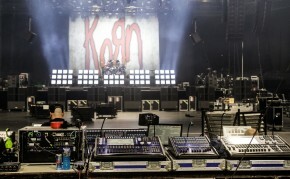 Lighting designer Thomas 'Church' Christmann once again called on the reliability and power of ChamSys lighting consoles for KoRn's 2017 world tour. The tour also includes their festival shows over the summer. Church comments "I was first introduced to ChamSys by long time ChamSys operator Gunnar Loose. I now do a lot shows for his artists and have quickly become a big fan of the ChamSys way of doing things." Church specified the MQ100 Pro2014 series consoles for the tour along with Playback and Extra wings, particularly utilising the onboard pixel mapping capabilities of the MagicQ system. The standard floor package on the tour consists of no less than 20 of Ayrton's Magic Panel R fixtures, which when all run in the full pixel would take up 64 universes alone. Church comments on the pixel mapper "I'm using all the options I can imagine - from big white light looks to ting dots moving around and movement effects". When asked about the MagicQ system to use Church commented "I like the easy & user friendly handling of the desk & the community around chamsys. Price & performance balance are the best"